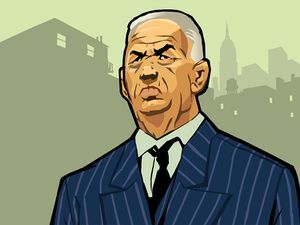 Hsin Jaoming (born in China) is a character from Grand Theft Auto: Chinatown Wars and is the seventy-three year old head of the Jaoming Family, and leader of the Triads in Liberty City. He is the father of Chan Jaoming, who is himself a Triad underboss. He is believed to be responsible for several murders and has been arrested on three occasions. First in 2002 for extortion, then in 2004 for assault and again in 2005 for racketeering. Hsin's first mention in the series is an entry in the LCPD database in Grand Theft Auto IV, accessible through a hidden link at the bottom of the police department's official page. While no photo is provided, the log lists several crimes committed by Hsin in Liberty City. It also provides a substantial amount of information on the structure of the Triads in the city, making mention of his son Chan, as well as underbosses such as Wu "Kenny" Lee and Zhou Ming, who all direct branches of the gang. The plot of Chinatown Wars revolves mainly around the race to succeed Hsin as the Triad boss, as he seeks to appoint a replacement and retire. After the death of his father, Huang Lee was asked to bring a supposed family heirloom, the sword "Yu Jian", to his uncle Wu Lee, the new head of the Lee family and a strong contender for new Triad boss. "Uncle Kenny" intended to present the sword to Hsin to solidify his position- however, Huang is ambushed by unknown assailants upon landing at Francis International Airport. Yu Jian is stolen, and Huang barely survives the incident. The loss of the sword devastates Kenny's standing with Hsin, and his businesses and territory are absorbed by fellow contender and Hsin's son, Chan Jaoming, as well as underboss Zhou Ming. Huang Lee's exploits on behalf of Kenny, and later Chan, earn Hsin's attention, and he recruits Huang for personal missions, including the assassination of several gamblers and unloyal Triads. Huang, Hsin and the other Triad bosses come to strongly suspect that an FIB informant is compromising their operations, and may have also orchestrated Yu Jian's theft. Hsin's ruthlessness is displayed when he orders the execution of several untrustworthy underlings not with firearms, but a sword. Even after Huang completes this task, he is confronted by Hsin, who, suspecting that Huang himself is the rat, intends to kill him on the spot. Only Uncle Kenny's intervention saves Huang's life. Around this time, Hsin's suspicions turn towards the Korean Midtown Gangsters, a group which has long been loyal to him. He orders their secret base of operations found and several files stolen, and their violent resistance seems to confirm his fears. Under Hsin's orders, Huang Lee decimates one of their warehouses, crippling them. However, Huang has been conducting his own investigations with undercover officer Wade Heston's help, and learns that a group of assassins known as the Wonsu Nodong operates from within the Midtown Gangsters, and concludes that their leader is surely both the FIB rat and the one responsible for the theft of Yu Jian. Heston and Huang recover a file which names both Chan Jaoming and Zhou Ming as rats. Presented with this, Hsin coldly orders the execution of his son and loyal underling, who both claim to have been set up before Huang eliminates them. Shortly after, Wade Heston informs Huang that the file which incriminated both men was a fake, and that the real Wonsu boss is having a meeting on Charge Island. Upin arrival, Huang is shocked and horrified to learn that the rat is none other than Uncle Kenny himself. Huang and Heston pursue Kenny to Hsin's penthouse, where he is confronting Hsin with Yu Jian in hand. Hsin demands that Kenny hand over the weapon, and, with a touch of irony, Kenny responds by cutting down Hsin with the weapon. After Huang enacts vengeance on his uncle, a gravely wounded Hsin tells Huang that he has what it takes to be the next Triad boss, to which Huang has no immediate answer. Officer Heston attempts to charge Hsin with some crime and says that he will think of "something heavy" on the way to the precint. While Hsin appears heavily wounded, lying in a pool of his own blood, he is not shown dying on screen. Wade Heston's dialogue seems to indicate that he expects Hsin to live. Hsin is very paranoid, most likely caused by years of leading one of Liberty City's biggest criminal syndicates. He, like Wu Lee, likes to speak using proverbs and analogies (even criticizing Kenny's dialogue in the last mission), but will use more foul language if he deems necessary. Suspected head of Liberty City's Triad Underworld. Believed to be working with both the Angels of Death OMG and several Korean street gangs. His son, Chan, works with him closely though is not believed to have the respect of the rest of the Triads. Chief suspect in the murder of several of his own employees though no one in the Triad Organization will testify against him. He lives in Lower Easton, Algonquin. His email address is HSIN@myroomonline.net. His telephone number is 555-806618. Even though, in Chinese and Japanese languages the last name is written first, Hsin is his first name, as he shares his surname with that of his son, Chan Jaoming. This page was last modified on 26 October 2013, at 15:22.